Bitcoin (BTC) Technical Analysis: Bulls Defend $5,000 Support, How Long Can it Hold? The crypto market is recovering from another bearish episode this morning after $12 Billion disappeared from the global market capital yesterday, and Bitcoin’s price suffered a -7.30% decline. 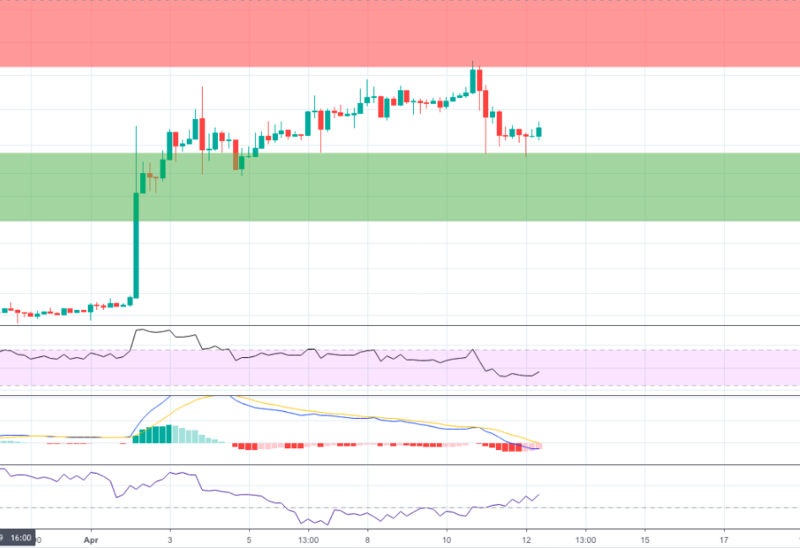 Bearish traders continued their assault into the early of this morning, driving BTC through its psychological $5,000 support around 02:00 (UTC +1) before meeting bullish resistance at the $4,950 level. Here, sellers quickly capitulated after bullish traders began to return behind the #1 cryptocurrency. 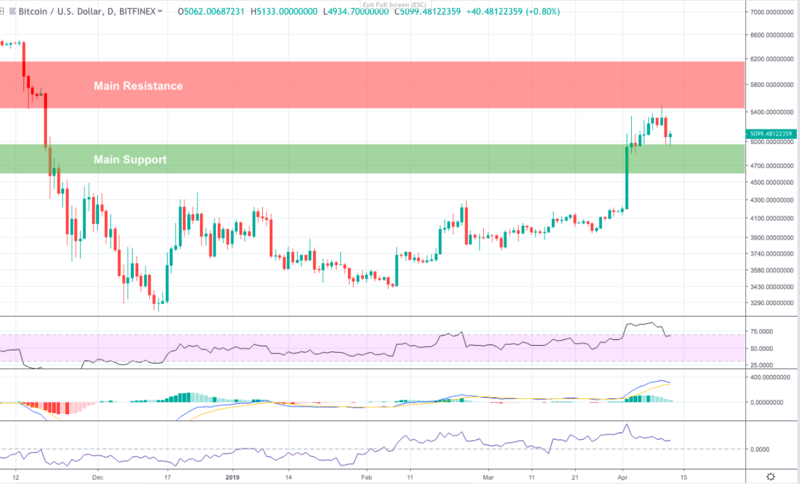 Since then, it appears that buyers have regained control over the asset temporarily and are now attempting to take back the $5,100 level above. At the time of writing, Bitcoin is currently holding on to a marginal 0.30% gain against the US dollar but is the asset out of the woods yet? On the 1W BTC/USD chart we can see that the price action is currently sitting in between its main support and main resistance areas. The 12MA on the MACD indicator is bifurcating away from the 26MA, with increasingly larger buying candles appearing on the histogram. The indicator line on the Chaikin Money Flow has just bullishly converged above the zero line for the first time since passing through it in November 2018. The RSI is still uptrending overall. On the 1D BTC/USD chart we can see a similar story. Long wicks beneath yesterday and today’s candles show that buyers are fighting to prop up Bitcoin against the recent price crashes. Momentum over 1D candles does however, appear to be waning slightly following the recent correction but does not seem to be suggesting that the trend has turned bearish. The RSI has returned into the index channel after breaking out into the overbought region at the start of the month, but is showing early signs of returning back over 70%. The 12MA is still above the 26MA on the MACD indicator, but the two lines are beginning to close in on each other as bullish traders start to tire. Lower volatility has forced the CMF sideways but for now the line is still holding above the zero line. On the 4H BTC/USD chart things are looking much more promising. The closer time frame shows that short-term buying momentum is already starting to reverse the price action. The 12 and 26 moving averages are beginning to converge on the MACD indicator. The CMF is showing a clear uptrend in buying pressure. The RSI is starting to bend back towards the upper end of the channel. The $5,200 is likely to become a temporary intraday resistance while buyers regain composure. 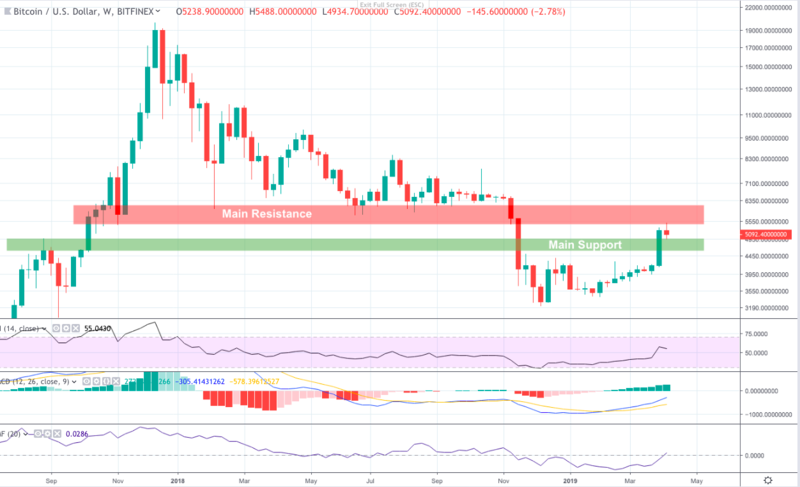 The $4,950 level will continue to be the main support for BTC while the crypto market stabilizes. If this fails, the $4,600 mark below will likely to be the next strong foothold for bullish traders to re enter into the market from.